The sofa bunk bed model Due is ready to be shipped. Contact us to receive information on delivery or arrange pick-up at our showroom in Meda. The sofa bunk bed model Due, available for immediate delivery, is upholstered in a soft fabric which is pleasing both to the touch and to the eye. With a simple movement the sofa bunk bed can be converted into two single beds, suitable for both the weight of an adult or a child. The patented mechanism has a special safety key which prevents the mechanism from closing during use. Thanks to the BertoPrima service, you can receive model Due directly to your door within a few days. • You are buying a product specially designed for the #BertoPrima service, ready for delivery. • You will immediately receive all the quality of a BertO product, made by hand in our Sartorial Upholstery department in Meda. 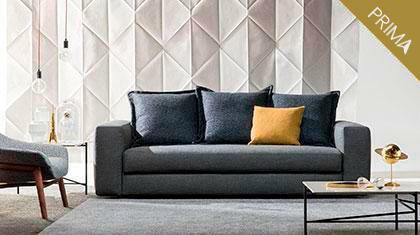 • Our interior designers and upholsterers personally select the best fabrics, colours and textures to enhance every model according to its structure, padding and style. The sofa bunk bed model Due is ready to be shipped. To receive information on delivery, contact us or you can arrange pick-up at our Fine Upholstery Atelier. We will be happy to meet all your needs. At BertO buying online is easy. Select a product, design it according to your needs then add it to your cart. Indicate your country of destination our program will automatically calculate shipping fees. If you decide to customize your product, click "Talk to us" a furnishing consultant the BertO Team will assist you.